Sportklub Rapid Wien are an Austrian football club playing in the capital city of Austria, Vienna. They are the most successful Austrian football club having won a brilliant 32 Austrian top-tier titles, including the inaugural title in 1911–12 and a German championship in 1941 during World War 2. Rapid twice reached the final of the European Cup Winners’ Cup in 1985 and 1996, but they lost on both occasions. The club is often known as Die Grun-WeiBen (The Green-Whites) based on their team colours. They are also referred to as Hutteldorfer in reference to the location of the Gerhard Hanappi Stadium, which is in Hütteldorf. The club was founded in 1897 as Erster Wiener Arbeiter-FuBball-Club (First Viennese Workers’ Football Club). The clubs original colours were red and blue, which are still often used in away matches, before they changed to green and white early in the 20th century. On 8 January 1899 the club was renamed to Sportklub Rapid Wien, a name they have retained ever since. This post is written by @Casual_FM_, you can find him over on Twitter. 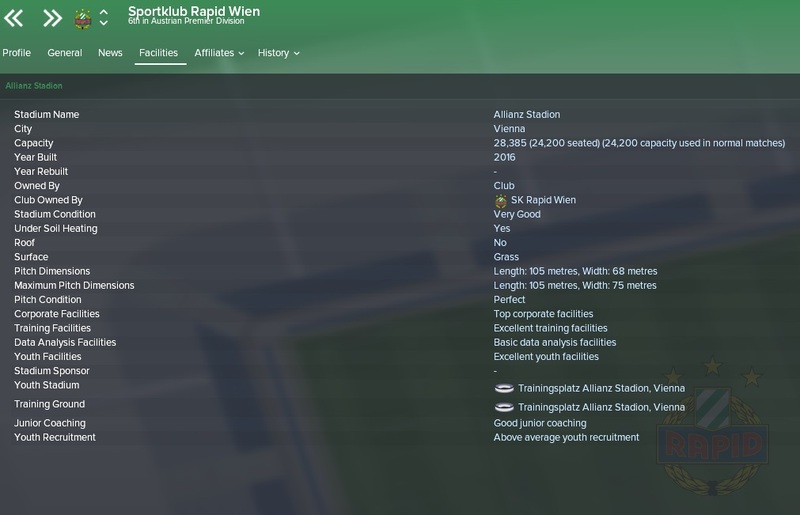 Enjoy his club guide on Rapid Wien! Austrian Midfielder Louis Schaub is a 22 year-old with some solid attributes including passing, dribbling and crossing. He is on only on £3.1k a week and he is definitely the best-rated players at the club and I would urge you to use him for that Attacking Midfielder spot on your team, he also looks like a very capable left or right-sided winger to me if you would like to use him out wide. Giorgi Kvilitaia is my other pick for a top player at the club. The striker is one of the better players in this squad and with 15 heading he could be played mainly as a target man. The Georgian man is valued at £1.2 Million pounds when the game first starts. My one position to improve in this side would be wingers as currently there is no outstanding option out wide. The left wing in particular is the position I would personally try to improve in the first transfer window as only Boli Bolingoli is really a decent option in that position. Our first hot prospect in the Rapid Wien ranks is Tamás Szántó. He could well be used as one of your first choice attacking midfielders if you choose. This would allow the young Hungarian first-team experience needed to improve. He currently doesn’t have any caps for his country but I’m sure that will change very soon especially if you use him consistently in your side. Our second hot prospect is a goalkeeper who goes by the name of Paul Gartler. He looks like he has the potential to become an integral part of your squad in the years to come. The 20-year-old Austrian is currently out on loan when the game first starts, but after a year of consistent first-team football, he could certainly challenge Richard Strebinger for the number one spot. 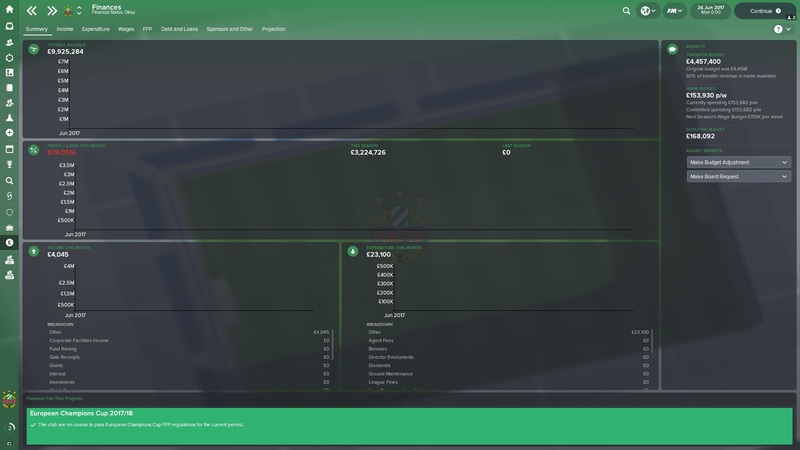 SK Rapid Wien have good finances with around £150k on the wage budget and also around £4.5 Million in the transfer budget. You won’t be partaking in any continental competitions in your first season due to Rapid’s poor previous season. This will mean that the money in the bank won’t last forever due to the lack of incoming tv / continental money. Spend what you have wisely! 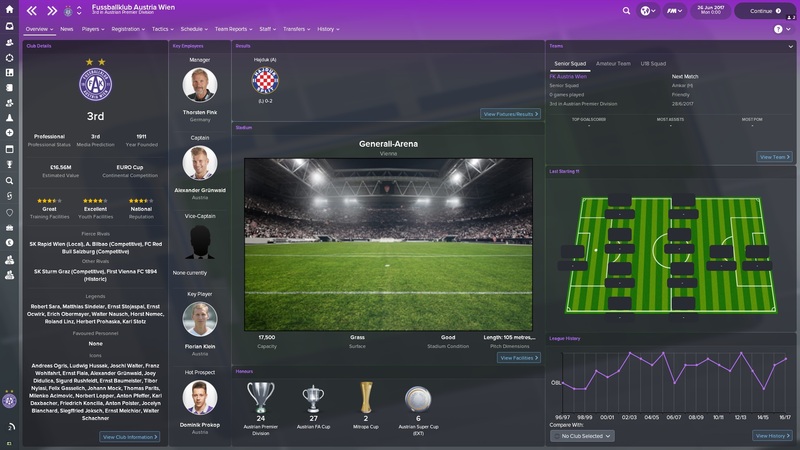 For anyone interested in managing Austria Wien on FM, I wrote a guide on the club for FM17. Do feel free to check that out by clicking here. So good luck to everyone who manages Rapid Wien and I hope you have a fun time over in Austria, please let me know how you get on in your saves either in the comments by heading over to my Twitter @Casual_FM_. Thank you for taking the time to read this club guide! 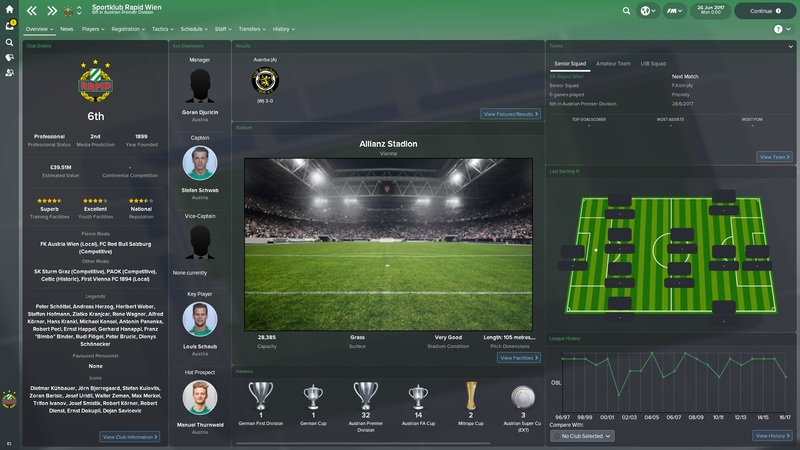 This entry was posted in FM Guides | Club Guides, FM18 Guides, Experiments & Wonderkids, Football Manager 2018 and tagged austria, club guide, europe, FM Guides, fm18, football manager, rapid wien. Bookmark the permalink.